Joint for chain Sunrace to 6/7/8 speed. Chain Sunrace to 3/6 speed color black. 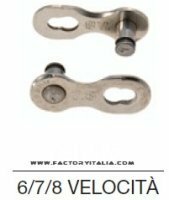 Chain Sunrace 6/7 speed color gray. Chain Sunrace 6/7 speed KMC UG51. Link to Sunrace 10-speed chain. Link to Sunrace 9 speed chain. Chain Sunrace 10-speed lighter silver color. Chain Sunrace 8-speed color gray. Sunrace 9 speed chain lighter silver color.